September 25, 1907 – The city’s Commissioner of Public Works, John Hanberg, following a conference with officials of Marshall Field and Company, rescinds his decree against public clocks on State Street, issued two days earlier. The commissioner had earlier also notified Spaulding and Co., Lewy Bros., and J. Florsheim to remove clocks from the street even though the city council had passed permits for them, noting that they violated the city’s prohibition against projecting advertising signs. 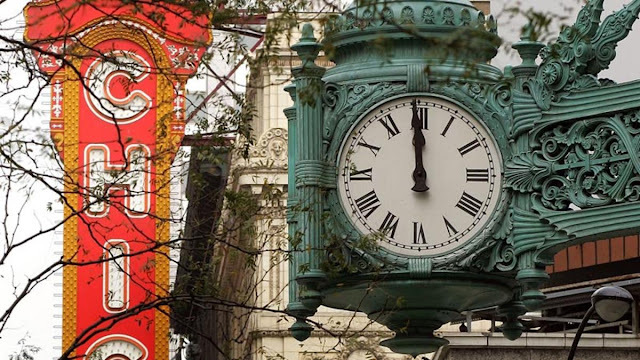 Marshall Field officials agree to omit any advertising features from the clock, so the timepiece, one of the main features of State Street today, is allowed. September 25, 1927 – The Chicago Daily Tribune reports that construction will soon begin on “one of the city’s most notable cooperative apartment buildings . .. . thoroughly American in its exterior design and in its interior treatment.” The Powhatan, to be located at Fiftieth Street and Chicago Beach Drive, a design of Robert S. De Golyer and Charles Morgan, combines the modern qualities of Art Deco’s fascination with historical references. The building will hold 45 apartments, ranging in size form six to ten rooms, that “will be the last word in luxury, with wood burning fireplaces, galleries with plaster beam ceilings, libraries, enough bathrooms to keep an entire family happy and so on.” The twentieth floor will hold a ballroom, and owners will enjoy a community swimming pool on the first floor. 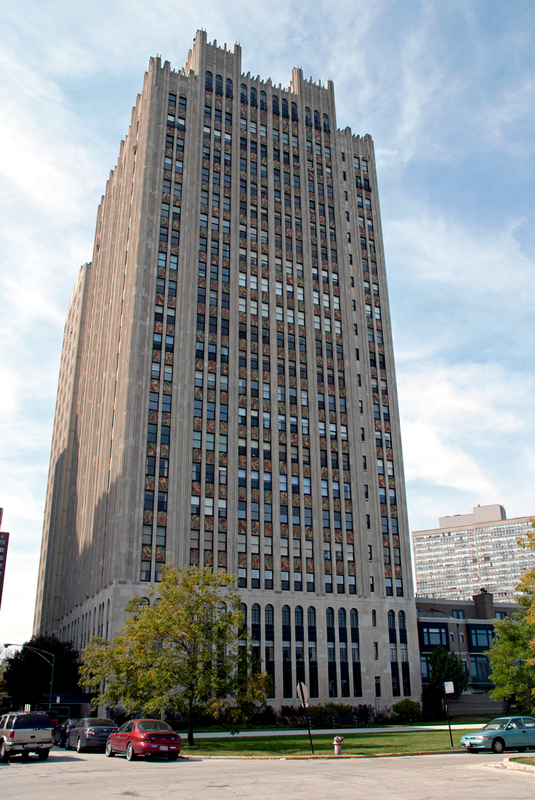 Today the Powhatan is an Art Deco jewel that has to be seen to be appreciated fully. According to Emporis it is the most expensive residential high-rise on Chicago’s south side. For the full story on this amazing building you can turn to this link.